The need to manage the firewall goes beyond just the virtual hosts; both VM and physical host firewalls must allow traffic for the ports required by the components to communicate with each other. The ports prefixed by "M" are ports used to manage the component and must be open on the component for access by the Management Server. The Edge UI requires access to the Router, on the ports exposed by API proxies, to support the Send button in the trace tool. Access to JMX ports can be configured to require a username/password. See How to Monitor for more information. You can optionally configure TLS/SSL access for certain connections, which can use different ports. See TLS/SSL for more. You can configure the Management Server and Edge UI to send emails through an external SMTP server. If you do, you must ensure that the Management Server and UI can access the necessary port on the SMTP server (not shown). For non-TLS SMTP, the port number is typically 25. For TLS-enabled SMTP, it is often 465, but check with your SMTP provider. All Management Servers must be able to access all Cassandra nodes in all other data centers. All Message Processors in all data centers must all be able to access each other over port 4528. The Management Server must be able to access all Message Processors over port 8082. All Management Servers and all Qpid nodes must be able to access Postgres in all other data centers. For security reasons, other than the ports shown above and any others required by your own network requirements, no other ports should be open between data centers. Cassandra 7000, 9042, 9160 Apache Cassandra ports for communication between Cassandra nodes and for access by other Edge components. 7199 JMX port. Must be open for access by the Management Server. 4526 Port for distributed cache and management calls. This port is configurable. 8080 Port for Edge management API calls. 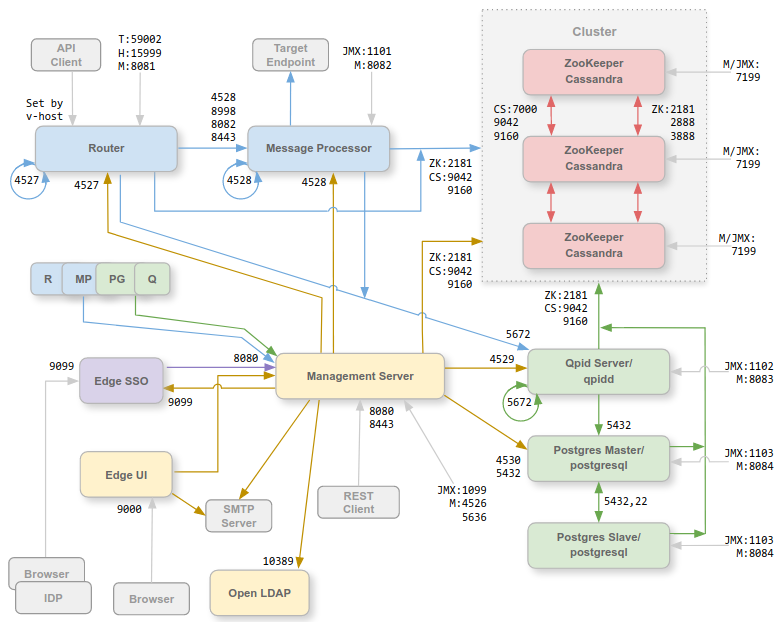 These components require access to port 8080 on the Management Server: Router, Message Processor, UI, Postgres, and Qpid. 4528 For distributed cache and management calls between Message Processors, and for communication from the Router and Management Server. A Message Processor must open port 4528 as its management port. 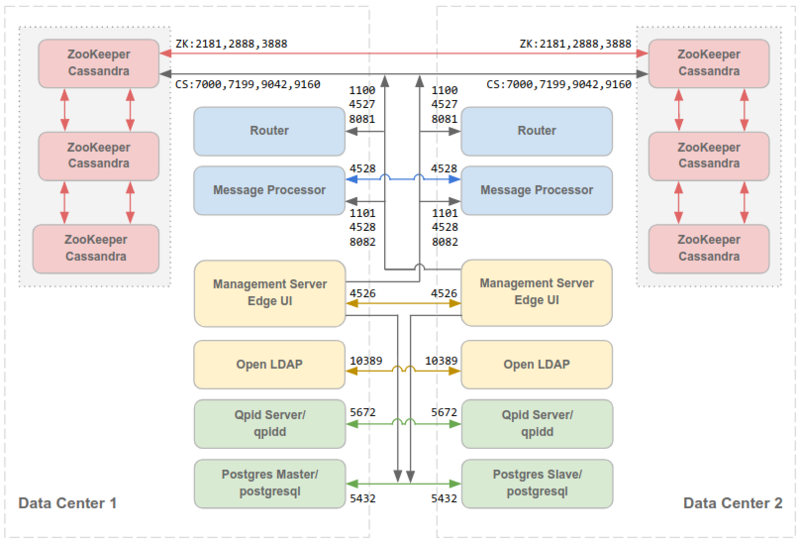 If you have multiple Message Processors, they must all be able to access each other over port 4528 (indicated by the loop arrow in the diagram above for port 4528 on the Message Processor). If you have multiple data centers, the port must be accessible from all Message Processors in all data centers. Default management port for Message Processor and must be open on the component for access by the Management Server. If you configure TLS/SSL between the Router and Message Processor, used by the Router to make health checks on the Message Processor. Port 8082 on the Message Processor only has to be open for access by the Router when you configure TLS/SSL between the Router and Message Processor. If you do not configure TLS/SSL between the Router and Message Processor, the default configuration, port 8082 still must be open on the Message Processor to manage the component, but the Router does not require access to it. 8443 When TLS is enabled between the Router and Message Processor, you must open port 8443 on the Message Processor for access by the Router. Postgres 22 If configuring two Postgres nodes to use master-standby replication, you must open port 22 on each node for SSH access. 8084 Default management port on Postgres serverand must be open on the component for access by the Management Server. Single data center: Used for sending analytics from Router and Message Processor to Qpid. Multiple data centers: Used for communications between Qpid nodes in different data centers. 8083 Default management port on Qpid server and must be open on the component for access by the Management Server. Router 4527 For distributed cache and management calls. A Router must open port 4527 as its management port. If you have multiple Routers, they must all be able to access each other over port 4527 (indicated by the loop arrow in the diagram above for port 4527 on the Router). While it is not required, you can open port 4527 on the Router for access by any Message Processor. Otherwise, you might see error messages in the Message Processor log files. 8081 Default management port for Router and must be open on the component for access by the Management Server. Health check port. A load balancer uses this port to determine if the Router is available. 59001 Port used for testing the Edge installation by the apigee-validate utility. This utility requires access to port 59001 on the Router. See Test the install for more on port 59001. SmartDocs 59002 The port on the Edge router where SmartDocs page requests are sent. A Message Processor keeps a dedicated connection pool open to Cassandra, which is configured to never timeout. When a firewall is between a Message Processor and Cassandra server, the firewall can time out the connection. However, the Message Processor is not designed to re-establish connections to Cassandra. To prevent this situation, Apigee recommends that the Cassandra server, Message Processor, and Routers be in the same subnet so that a firewall is not involved in the deployment of these components. Set net.ipv4.tcp_keepalive_time = 1800 in sysctl settings on Linux OS, where 1800 should be lower than the firewall idle tcp timeout. This setting should keep the connection in an established state so that the firewall does not disconnect the connection. On all Message Processors, edit /opt/apigee/customer/application/message-processor.properties to add the following property. If the file does not exist, create it. On all Routers, edit /opt/apigee/customer/application/router.properties to add the following property. If the file does not exist, create it.